For anyone who has ever had as much as a 5-minute conversation with me, what I am about to say will come as a complete shock. So make sure you are sitting down, and do not take a sip of anything that you could spew onto the computer screen. Here goes. I’m pregnant. I know, I know. None of us ever thought this was going to happen. I’m almost 3 months into it, and I’m still getting used to the idea. In fact, today—Friday the 13th—marks the first day of week 13. And with lucky numbers like those, what better day to let the world know? It’s been a rough ride so far. 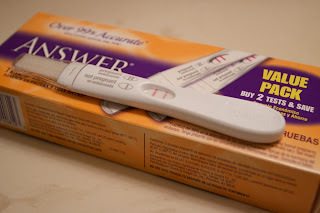 In the first 5 or 6 weeks I threw up 80 times (yes, I kept track of it), and even when I wasn’t throwing up, I felt like I was going to at any minute. I couldn’t eat any fruits, vegetables, grains, nuts, eggs, meat, dairy, or soy. That didn’t leave a whole lot left to choose from. I lost maybe 5 or 7 pounds, but considering that I started out as a svelte vegan marathon runner, I didn’t have a whole lot to fall back on. I tried every home remedy ever invented, and I threw them all up. I became insanely jealous of women who told me they threw up in the grocery store or in the car on the way to work, because I couldn’t do any of those things. Pretty much all I could do was lie in bed and puke into a bucket. Sometimes I found a modicum of relief by putting an ice pack on my head to numb the throbbing migraine that had lodged itself behind my left eye and refused to let go. But still, there was the unrelenting nausea. It felt like I was on the boat—the little boat—during the windy season in Nicaragua. It felt like the time that Rob and I went back to the mainland on a day when the lake was particularly rough and I threw up on the ferry. The only difference was that the ferry ride lasts—at most—an hour and a half. This was like being stuck on the little boat with no land in sight, every minute of every day. I couldn’t work because looking at the computer screen made me sick. I couldn’t even sleep because the nausea (and my fear of chocking to death on my own puke) kept me awake. I told people that I had the flu or that I’d gotten salmonella (the whole peanut scare really worked to my advantage), but none of that was true. My midwife called this “hyperemesis gravidarum”—fancy Latin words that basically just mean “excessive” nausea and vomiting during pregnancy. This is what my sister had when she was pregnant with Logan. My perception of her experience was that she endured something that I really would not have thought possible for a human being to survive. Supposedly, only about 1 or 2% of women have it this bad, but in my research (and believe me, I’ve done a lot of research), I found that your chances rise to about 19% if your sister has had it. I am definitely not as sick as my sister was, but still, I fall into a minority group that I really do not want to be part of. The one good thing to come out of this part of the experience is that I am determined to write a review paper on “morning sickness” and totally tear down these dumb-asses who maintain that it’s some evolutionary adaptation that prevents the mother from ingesting toxins that could be harmful to a fetus. The hell. What I experienced was most decidedly not adaptive. If there are any Anthro people are reading, I’m looking for collaborators. I started out wanting to do this whole thing totally old school and all natural, but I got so run down that I was willing to do anything for a little relief. I’ve tried 3 different medications—none of which has really helped. I’m currently on the generic version of “Zofran”—a drug they give to help chemo patients with nausea. It costs $675 for a 2-week supply, but thankfully, my insurance (actually, Rob’s insurance) covered all but a $15 copay. It sort of takes the edge off sometimes, and for the most part it has stopped me from throwing up. But the nausea and migraine are always there. Always, always. I’ve tried really hard to be excited about this. Rob and I first stood staring at that Big Fat Positive on December 12th, and by Christmas, I was throwing up at my parent’s house. We told our immediate families, but I was hesitant to tell anyone else. I said it was because I was afraid of something happening and then having to tell everyone that we wouldn’t be having a baby after all. But really, I think it was because I couldn’t stand to hear anyone say “Congratulations” or “That’s wonderful.” It felt like I was dying of an incurable parasite. It felt like I had ruined my career and would never end up finishing my dissertation. It felt like I had qualified for the Boston Marathon but now would be unable to run it. It felt pretty damn awful. The drugs sometimes give me a few brief lucid moments when I think I might survive this—when I entertain the thought that Rob and I will soon be holding a little baby, and I will somehow manage to finish my dissertation, and I will end up running the Boston Marathon in 2010. My mom has been following a website that gives her updates on the baby’s development, and one week she informed me that the baby was the size of a fig. Fig, I thought. Fig is a good name. I have so many happy memories of watching the monkeys in the big fig trees on Ometepe. I already know exactly what this baby is going to be named when it is born, but for now, Fig is what we will call it. Fig suits it well. So Fig is due to arrive on August 21st, which I think is a wonderful time of year to be born. Now that I am 13 weeks pregnant, little Fig has grown to the size of a peach. For many weeks he/she has been moving about (though I won’t feel it for some time), and what I think is the cutest thing is that Fig can open and close his/her hands. A little while ago I had biked to campus (a huge ordeal, considering that biking makes me nauseous), and while I was on my way home, I was pretty sure that Fig was in there, waving her arms and opening and closing her little hands. Just picturing that made me laugh hysterically. At my last doctor’s appointment, I got to listen to Fig’s heartbeat, and my midwife was delighted that it was so good and strong. I was delighted too, of course, but I really wasn’t surprised at all. From the moment Fig arrived, I knew that he/she was good and strong. There are a million, billion more things to say, but I’ve gone on too long already. I’ll keep posting in the coming weeks, as the story of Fig unfolds. Fig on January 7 at 7.5 weeks. 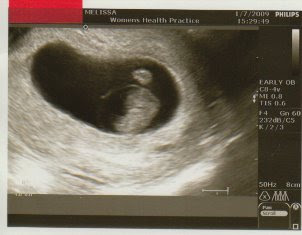 It feels a little weird to have a picture of my uterus on the internet. i guess we'll have to see who the baby looks like when it come out. P.S. I do think the ultrasound picture bears a striking resemblance to you. I think you forgot to # the caption of your ultrasound. "Fig 1.1 Fig on January 7 at..."
Congratualations we are so excited for you. CONGRATULATIONS RAGFIELDS!!!!!!!!!! !--:) NOW OUR EXCITING NEWS IS OUT THERE FOR THE WHOLE WORLD TO KNOW!!!!!!!! May the next few months zoom by and SOON little "FIG" will be JOINING us in all the family FUN!!!! Hang in there, your sis survived, so there is hope for you. I can see you and Fig running down the road someday, racing to the finish line, with FIG waving along the way!!! HUGS and luv to all, foxy?um mama/ grama? OKAY -- now i can quit clicking and clicking to see your story about Fig -- what a great introduction!! Even though 'the father' might not have top billing in the 'announcement', i'm thinking he will receive more mention as time goes on!! and I'm thrilled to be the GREAT auntie!! hugs and more hugs to you all ! ! ! Well, I hesitate to say 'congratulations', but CONGRATULATIONS!!!!!!!!!!!!!!!! This will be so fun for all of us out here, to watch and read all of your experiences during this pregnancy. Much easier on our end than yours! I will be hoping that each and everyday you get to feeling better and can REALLY enjoy being pregnant. Now that the news is out, we will all be anxiously awaiting Aug 21st along with you and Rob. So glad for the post! I feel so terrible that my story of throwing up at the grocery made you upset :( It wasn't my intention. I can't wait to see all the belly shots!!! thanks everybody for your lovely comments. it's working better than Zofran. Yep, GranScho agrees "fig" looks a lot like Rob, that means you'll have a tie for the cutest little boy/girl ever! Grandparents are always thrilled when they hear this news. Can't wait until the Boston Marathon! We're gonna be there with the punkin to cheer mommy on... It'll be here before you know it! Congrats... again. Hope that the puking and nausea come to an end soon for you. I've heard that some women actually enjoy this experience. You'll have to let me know if this is true. We'll look forward to Fig's arrival and to the definitive paper on morning sickness.